Journalism is a part of a big nation; free press is a tradition of Americans People as guaranteed by the First Amendment of the constitution. But this tradition faced a big challenged when Julian Assange creates and launches Wikileaks in 2006. 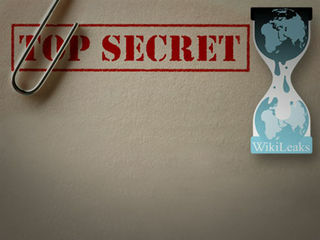 Wikileaks is an international, online news portal organization publishing secret documents, information and classified media from anonymous sources. According to the leaked documents published by Wikileaks.org, Bush’s administration has done many things regarding the involvement of U.S. Government in Afghanistan. First, In 2007 Bush’s administration managed equipment held by the US Army, Marines, Air Force, coalition, and possibly CIA units in Afghanistan. The leaked document with NATO Stock Number records from public US logistic equipment discovered that there is at least $1,112,765,572 worth of US Army managed military equipment in Afghanistan. Second, the use of military robots. Another Bush’s administration strategy on the military operation in Afghanistan is the use of Military robots in combats. According to the leaked documents, there are at least 28 Pacbot tactical robots, 55 MARCBOT IV “experimental” robots, 86 “explosive ordinance disposal robots’ and 7 drone aircraft. Military deployment and diplomacy (third and fourth), increasing military deployments are what I think also one of the strategy, while the Bush’s administration also intensifying the use of diplomacy he want to make sure that he still has a strong military power in the field. Fifth, utilizing the UN body. United Nations also has military forces (peace keeping forces) that can be deployed to help the US forces if agreed by the permanent members of the Security Council. Through the centuries Afghanistan has been one of the most treacherous areas of the world – a country difficult to conquer and nearly impossible to break. In the last 200 years, the British and Russian empires as well as the former Soviet Union sent their armies into the region, only to have them beaten back. There are several reasons behind the fact that Afghanistan is really hard to conquer by other countries. First of all, Afghan People has been experiencing combat and war more than 20 years. This made them used to any combat situation. Second of all, geographically Afghanistan is a place full of mountain and desert. It is very difficult for troops, especially for foreign troops whom have a little combat experience in this kind of field. On the other side, however, this situation is really advantageous and perfect for a guerrilla campaign. Unfortunately, however, these facts seem to be ignored by President George W. Bush when he send US Soldiers to Afghanistan 11 years ago (2001). This was the beginning part of what President Bush called War on Terror as a response to World Trade Center terrorist attack on 9/11 to eradicate Al-Qaeda from the land of Afghanistan. The operations of war on terror, however, not only cause casualties in Al-Qaeda side but also in US side. As reported by The Times, as of October 2012 more than 2000 soldiers are killed in this bloody operation against terrorist. This military operation is considered legal under US Constitution. The President has broad constitutional power to take military action in response to the terrorist attacks on the United States on September 11, 2001. Congress has acknowledged this inherent power in both the War Powers Resolution and the Joint Resolution passed by Congress on September 14, 2001. The President has constitutional power not only retaliate against any person, organization, or State suspected of involvement in terrorist attacks on the United States, but also against foreign States suspected of harboring or supporting such organization. Although the military operation in Afghanistan is considered legal under the U.S. constitution, many say that the operation is fraught of political interest. In fact, the military operation left behind some question that might be resulted at odds answers. For instance, many believe that it is better to take a diplomacy approach at the first place before deploying military forces in Afghanistan. In this case, I believe that diplomacy could be more effective and significantly less expensive compared to military operation. According to the leaked documents released by Wikileaks, Obama’s administration has several strategies on the military operation in Afghanistan. First, the President increases the use of military robot in the battle field rather than human soldier. Second, increase the use of drone or un-manned aircraft. Third, train the Afghanistan military forces so that in the end of war they can handle themselves. Forth, increase the use of diplomacy to approach the remnants of Al-Qaeda in Afghanistan. Fifth, he also plans to end the war as soon as possible by the end of 2012. Ending the war and the military operations in Afghanistan are also his priority to be done. I think this is really important, because what I believe is that America with its foreign policy need to understand and accommodate the rest of the world, while on the other hand the rest of the world also need to understand the United States. Mitt Romney did not say anything regarding Afghanistan or the military operation in Afghanistan in his acceptance speech on August 30, 2012. Some pundits criticize the GOP’s Presidency candidate by saying that he failed on delivering important issues regarding the military operation that include more than 80,000 soldiers in Afghanistan. President Obama still covered the war in Afghanistan in his speech because he realized that the military operation in Afghanistan still become one of the big and national issue across the country and even around the world. That is way I believe that to tell your voter about what do you think on the military operation in Afghanistan is something that you cannot simply leave out. Yoo, John. “The President’s Constitutional Authority to Conduct Military Operations Against Terrorists and Nations Supporting Them.” 25 September 2001. 2 October 2012. Bingham, Amy. “Afghanistan War by the Numbers: Lives Lost, Billions Spent”. 1 May 2012. 2 October 2012. “Obama’s Speech”. National Public Radio (NPR). 6 September 2012. 2 October 2012. Shapiro, Rebecca. “Rachel Maddow Criticizes Mitt Romney’s RNC Speech For Leaving Out Afghanistan War Mention (VIDEO). 4 September 2012. 2 October 2012.